Florence Catherine Shelton Clark Jones passed away quietly on May 22, 2014 at the age of 96. She was predeceased by her first husband William Adolph Clark to whom she was married 48 years. From this union were born two daughters, Rose Thurston and Ruth Coward. In 1986, she married the late James C. Jones. 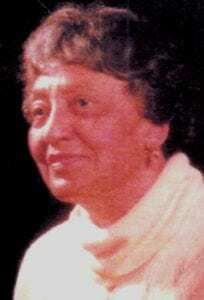 Florence was an educator graduating in 1934 from Bowie State Teachers College (Bowie Normal School). Her first teaching assignment was at Rosaryville Elementary School in Prince George’s County. Also trained in nursing, Florence worked for a short time as a nurse at the Old Providence Hospital in Southeast Washington, DC. In 1960, she returned to teaching and joined the teaching staff at Our Lady of Perpetual Help Catholic School becoming its first lay teacher. Later, she went on to teach in the DC Public School System and retired in 1972 as a reading specialist. Florence was a former member of Our Lady of Perpetual Help Catholic Church and in 1960 became a member of St. Francis de Sales Catholic Church. There she was a member of the Ladies of Charity and the Sodality. Also, she was a member of the Early Finance Committee and counted church money for 20 years until her sight began to fail. Florence’s faith in God and love for the Blessed Virgin Mary were at the core of her being while her love for her family knew no bounds. She was dearly loved and we will all greatly miss her love, wise counsel and many, many acts of care and kindness. May you rest in peace, our dear Lady of Charity.